It’s not often you get to see the perfect pairing of actor and role, and when you do the experience is magical. Such is the case in VIOLET the Musical, now onstage in the Monroe Forum at the El Portal Theatre in No Ho. Thanks to the brilliant direction by Joshua Finkel, Brentwood resident Kristin Towers-Rowles shines as the title character, putting aside her own natural, theatrical persona and completely embodying the role of a country girl from the Blue Ridge Mountains of North Carolina setting off on a journey of hope and discovery aboard a Greyhound bus bound for Tulsa, Oklahoma. With lyrics and book by Brian Crawley and music by Jeanine Tosori VIOLET is based on the short story THE UGLIEST PILGRIM by Doris Betts, set against the backdrop of the 1960s Civil Rights movement. Hideously scarred by her father during a wood cutting accident, Violet sets off in the hope a TV evangelist can create a miracle and cure her disfigurement. Along the way, she meets a young black soldier who teaches her about beauty, love, courage and what it means to be an outsider. Jahmaul Bakare carries the role of Flick to great heights with just the right amount of sensitivity, sensuality and bravado, truly a perfect match for Towers-Rowles vulnerability and desire to be pretty and loved for who she really is. You will be swept into their love story as it develops, two young people travelling through the South at a time when integration was not a welcome sight. But he is much more than that and thankfully, even amid warnings from both sides of the fence, these two manage to find their way to each other and into our hearts. Flick is travelling on the bus with another solider, Monty (Michael Spaziani), who is intent on volunteering for Vietnam. “It’s not much of a war,” he tells Violet, generating many harrumphs from the audience. When the three have an overnight layover in a small Tennessee town, local ruffians attack the trio, stealing Violet’s suitcase in the process. After checking onto a small hotel run by Flick’s friend (indignant Erika Bowman), a night of drinking leads to Monty seducing Violet, a decision she regrets in the morning knowing he was not the right man for her. Safer, no doubt. But not right. Violet tells her story by reading excerpts from her journal, acted out by Young Violet (Jaidyn Young) and her father (Jason Chacon). The two actors allow us to see into Violet’s troubled mind, sharing her torment as well as her joys as she travels from her Old Life to her New Life. Integrated into each scene are graphics of the various locales from the bus terminal to the Blue Ridge log cabin and various stops along her journey. Many of the talented actors in the cast play dual roles, notably Richard Lewis Warren who steps off the bus as its gruff driver and into the role of the Evangelical Preacher and makes it his own. He and Towers-Rowles are backed by the entire ensemble as the church meeting choir, led by the righteous gospel singer Erika Bowman. You truly want his sermon to work wonders for Violet, but she soon discovers he is just man and only her own faith can truly transform her life. Gail Matthius morphs from a conservative elderly bus rider to a drunken lounge singer in the blink of an eye, able to slide into the highly physical humor, generating some of the biggest laughs in the show. Benai Alicia Boyd is Mabel, another older lady on the bus and then sparkles as a lively Music Hall singer. and Justin Anthony Long, most notably as Billy Dean, Young Violet’s first and very inexperienced lover. and Jason Chacon on percussion. Inspirational lighting design and rolling chair choreography by Samantha Marie add to the many cleverly magical moments in the show. Debuting off-Broadway in 1997 and then making an a critically acclaimed and Tony nominated comeback in 2014 - “Violet” is an amazing story, set in the 60’s, of a young woman’s journey to find herself and the realization her facial scar is not her burden but her shield - made of pride and heartfelt honor. 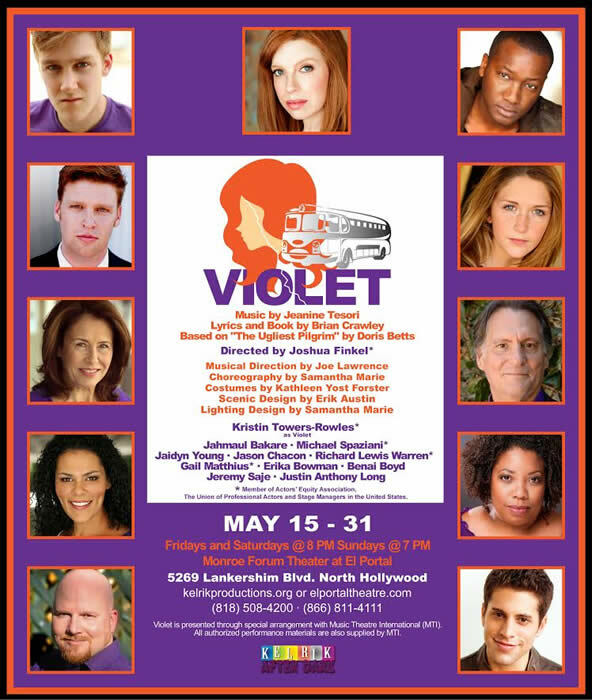 Kelrik Productions presents “Violet”, this wonderful and touching musical for everyone to enjoy at the incrediblly fabulous El Portal Theatre in North Hollywood, CA. Having never seen this show before, it was an amazing experience and how surprisingly entertaining of a show this turned out to be. Based on “The Ugliest Pilgrim” by Doris Betts with the book and lyrics written by Brian Crawley and amazingly wonderfully rhythmic music written by Jeanine Tesori – you are in for a real fun experience. With a limited stage area and a very talented ensemble of performers this production was at the helm of director Joshua Finkel, who made this such an exciting, extremely touching and a very vibrant musical to watch. I also must give more special kudos to the sharp musical direction of Joe Lawrence, the fanciful and rhythmic choreography (as well as lighting and stage management) by Samantha Marie, the uniquely smart and no-nonsense set design by Erik Austin and finally the period perfect costuming of Kathleen Forster – put all these talents together and you have the amazing Kelrik production of “Violet”. Kristin Towers-Rowles gives an incredibly fun, full-of-life, passionate and exhilarating performance playing the title role of Violet. From her opening insightful musical number called ‘Surprised’ to the sentimental ‘Lay Down Your Head’, from her vibrant duets like ‘Hard To Say Goodbye’ and ‘Look At Me’, Kristin gives a really stellar performance with both high energy and a very wonderful spark of emotional charm making the character Violet very real and very emotional for the audience. Coupled with her amazing voice and natural sense of humor - she will leave you cheering and uplifted by the end of the show. Kristin is truly amazing in this role, just amazing!! Jahmaul Bakare plays Flick, an Black-American soldier who meets Violet on this bus and begins a journey of self-realization with her - to eventually have feelings for her himself. Jamaul has a very piercing voice that resonates all the passions and desires of his character. The depth of his performance with Kristin, just made their chemistry extremely real and visceral. His songs ‘Let It Sing’ and the trio song ‘All To Pieces’ will move you. Michael Spaziani plays Monty who is another soldier and with a very distinctly different personality that actually guides Violet to understand what she really doesn’t want and what she needs. Michael is energetic and extremely intense with his performance and his amazing voice during the songs ‘You’re Different’ and Promise Me Violet’ will definitely impress you. Jaidyn Young plays the younger version of Violet when she must come to terms of an ‘accident’ that left her scared. Jaidyn is perfectly cast as her subtle sincerity and innocents are what allow us, as the audience, to understand who the woman is she becomes. She has a haunting duet with Kristin ‘Look At Me’ along with her ensembles songs with amazing solo pieces in ‘Water In The Well’ and ‘Luck of The Draw’. Playing rather sternly and with great conviction is Jason Chacon as Violet’s father. Jason is strong and determined and plays the sincerity of his grief and regret with real emotions. With his amazing voice, he really shines with the song ‘That’s What I Could Do’ and also sings with great passion in the songs ‘Water In The Well’ and ‘Down The Mountain’. He is a wonderfully interesting and talented actor to watch. The rest of this amazing ensemble cast includes; Playing the role of a very convincing Preacher (also a few others) is Richard Lewis Warren who gave it a wonderful broad performance. The wonderful voices of a Hotel singer (and as an Old Lady) were the remarkable talents of Gail Matthius who shines in the song ‘Anyone Would Do’. The sharp witted Landlady (and Gospel Singer) was powerfully sung and performed by Erika Bowman and what a voice too! The character of Mabel (and the Music Hall Singer) was sensitively performed by Benai Boyd with her amazing singing talents as well. The versatile parts of a Waiter, a Singer and a Mechanic were nicely played (and sung) by Jeremy Saje who completely created very separate characters with each role. Justin Anthony Long gave a spot-on performance as Billy Dean and as the character Virgil who both are pivotal to developing Violet into who she becomes. Lest I not forget the incredible performances of the live on-stage band – it is performed by Joe Lawrence on keyboard, Barrett Wilson on Guitar and Jason Chacon on percussion who all were fabulous and made the music a real treat to listen to. 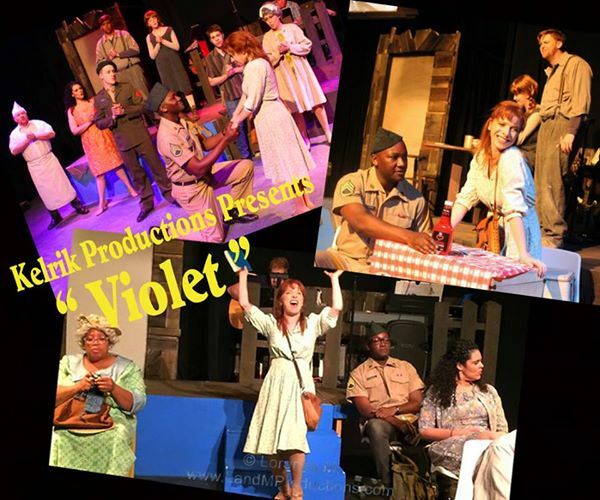 Kelrik Productions at the El Portal Theatre in North Hollywood has something everyone should see at least once – it’s called “Violet”. A wonderful rich story with a very clever musical score throughout the show and a cast you soon won’t forget, “”Violet” was simply an amazing musical to watch! Check them out at www.KelrikProductions.com and the www.ElPortalTheatre.com tell them Lorenzo sent you from www.FaceBook.com/TheGeekAuthority !